Help our community have a louder voice! If you share a vision of positive change through independent media and a sense of discovery, be an inspiration to help and connect the Treasure Valley (and beyond) in 2019. All gifts, no matter the size, fund the optimism utterly unique to community radio – show your support today. Get a membership to the Radio Boise Hi-Fi Society for access quarterly Hi-Fi house concerts, limited edition album cover artwork and and VIP tickets to Radio Boise events. Plus, choose any one (two for Gold Level) premiums. Choose our light-weight long sleeve hooded tee with drawstring, plus our brand-new logo sunglasses in shiny graphite, and you’ll be ready to hit the trails. This special, limited-edition print of Erin Cunningham’s artwork, created just for Radio Boise supporters like you. Grab one before they’re gone! Available in unisex or women’s cuts. Sizes SM – 2XL. Choose between our classic hat, with grey fabric front panels and black trucker mesh back featuring the Radio Boise logo, or our new knit beanie. Risky Business?! 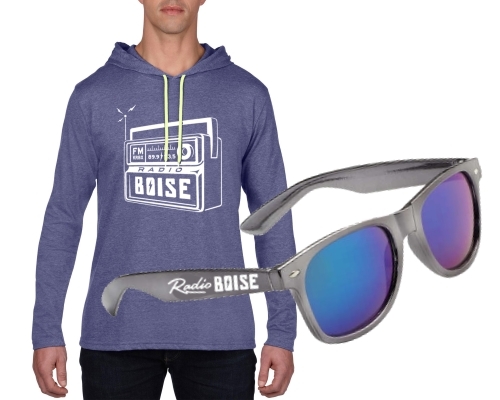 Show off your Radio Boise spirit in our comfy cotton crew socks and brand new logo sunglasses in shiny graphite. 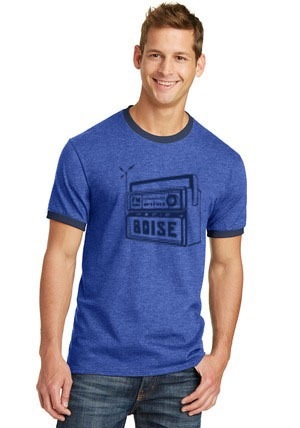 Don’t miss out on the latest color vintage, extra soft classic ringer T-Shirt featuring the Radio Boise logo. Sizes XS – 4XL. Grab our new swag bag! This all-natural cotton cinch backpack comes with Radio Boise surprises inside. 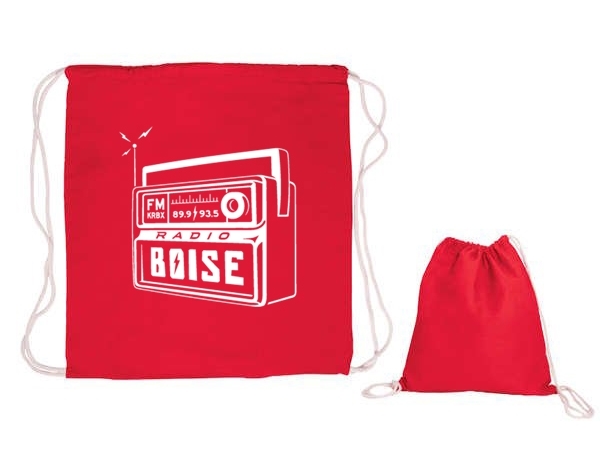 Our Swag Bag features stickers, buttons and the coveted Radio Boise can koozie. Records fit inside perfectly! 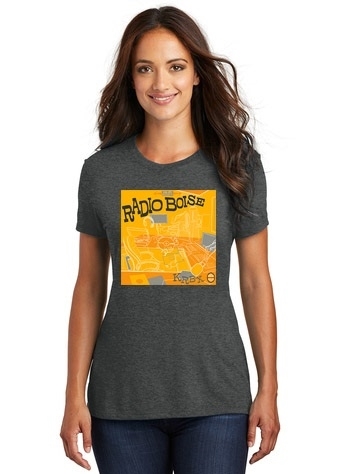 Every contribution keeps Radio Boise Alive! Sport this quality vinyl die-cut decal on your transport, tech or wherever you want to show off your contribution to community radio. Available in white. 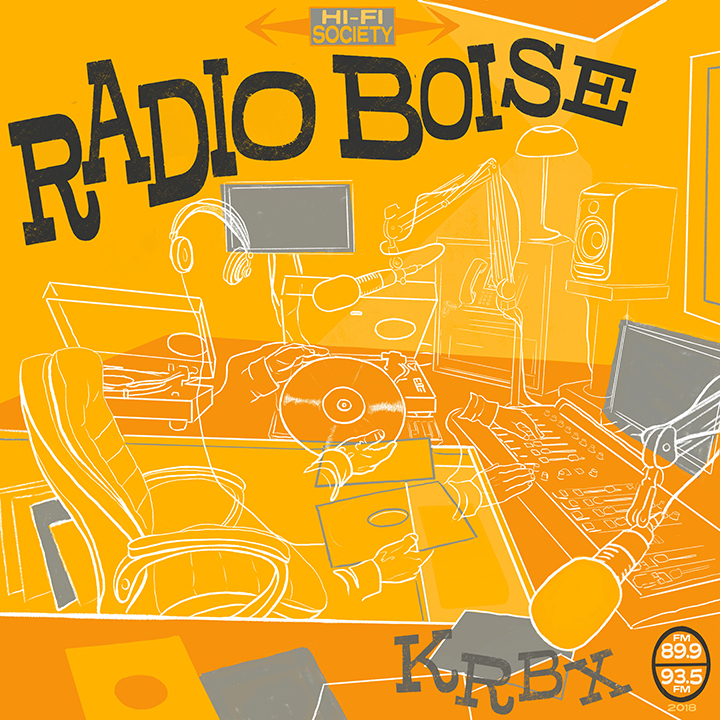 Radio Boise wants to expand our team of media makers, and your gift will support quarterly audio production and podcasting workshops for community members (maybe you!). The goal is to train enough producers to air a regular program of local, personal stories from around the Treasure Valley for the airwaves and for on-demand digital content. Our small staff leverages the power of over 400 volunteers, and your gift makes it possible for them to keep Radio Boise’s community engaged in the creation of great radio and online content. Each contribution expands the diversity of our connections within the Treasure Valley and powers discovery of music, arts, and independent voices. Radio Boise’s in-studio performances connect you to our local music scene, and in addition to delighting your ears your gift will bring more live music to your eyeballs! We’ve got a crack team of volunteer videographers who are now live-streaming in-studio musical performances. With more funding, we’d be able to expand the number of performances by independent musicians, artists, and performers available to a broader audience online. From Radio Boise Tuesdays to our Practice New Year’s Eve Party, we love to bring live music to you throughout the year. Your donation will ensure that we can continue to explore new sounds together at community events and local venues!